The problem there is that while most of us have opinions on what the Goldwing should come equipped with, none of us know what it should look like overall. That's because most or all of us are at the consumer end of the spectrum. We buy the stuff and don't have experience in design. Some of us flunked art too. Of course you would also need at least one member proficient in hard surface CG modeling (I can't do that) to make it look real. If you can come up with the art work, I am sure these chaps can make it real. I am no expert on MC design, but I can tell you what practical improvements I would like to see on a future Goldwing. 1. Headlight running right across from mirror to mirror. Get rid of the chrome or black filler pieces where the current headlight ends, instead extend the headlight up to the mirrors. 2. Better foot protection from rain. Heated saddles and grips are useless when my "waterproof" boots are soaked through. Honda should have beaten that by extending the lower fairing or the engine covers out to keep rain off boots. 3. Place the warm air vents in more practical places. The lower vents (in the exhaust covers) in the newer 1800 and on the old 1500se are too far forward and any warm air gets whisked away by the forward motion of the bike. Those vents should be nearer our feet. Make the lower fairing knee area vents bigger. Make the windshield vent wider and get rid of the small fiddly vents near the speakers. I'll take bigger speakers instead. 4. Extend the dash cover out to better cut down reflections from the instruments. 5. More side lighting, along the saddlebags and fairing. 6. Get rid of the long antenna and replace it with a low visibility antenna. The long ones look cool but are impractical and they often rip motorcycle covers. +1 on better foot protection. I would like to see the wheels solid type wheels. They would be easier to clean and look better imho. Personally it wouldn't hurt my feeling if Honda were to keep the current production Gold Wing for a while and spend the money and R&D time in working out the bugs and making the electronic more dependable. Unfortunately that isn't going to happen. 1. Make ABS an option without having to buy XM and GPS. I'd definitely buy ABS, but not if I have to buy XM and GPS as part of the deal. 3. Make factory seat an option. I'd rather spend the dollars saved on something proven to be much more comfortable for the long haul. Almost forgot. If you guys can pull together as a team and think about how a new Goldwing should look, I would be happy to give some free time to the artwork. It might be fun to do. Of course you would also need at least one member proficient in hard surface CG modeling (I can't do that) to make it look real. I'm surprised nobody took you up on this. I think you being the only forum member actually working in automotive design, you might be better off doing the initial art work yourself based on what you think a new Wing should look like. Once you get the ball rolling others will come along with input. I think you being the only forum member actually working in automotive design, you might be better off doing the initial art work yourself based on what you think a new Wing should look like. Once you get the ball rolling others will come along with input. Okay, I'll get things rolling. I will start with the front end/wheel. 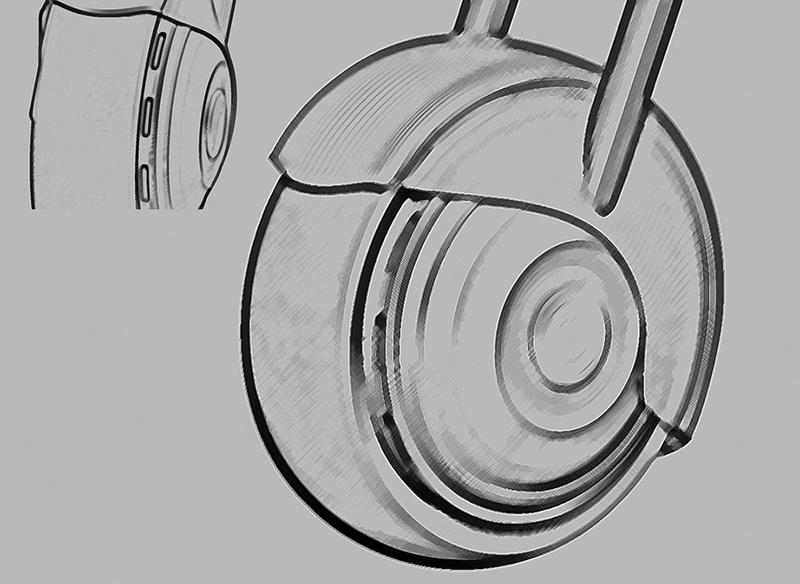 I would like to see (for easier cleaning) either a solid wheel, or a fully enclosed wheel. I would also like to see much wider tires. I have attached a rough sketch to show the general idea. Thanks Andy. I will PM all of them now and see if they can help.